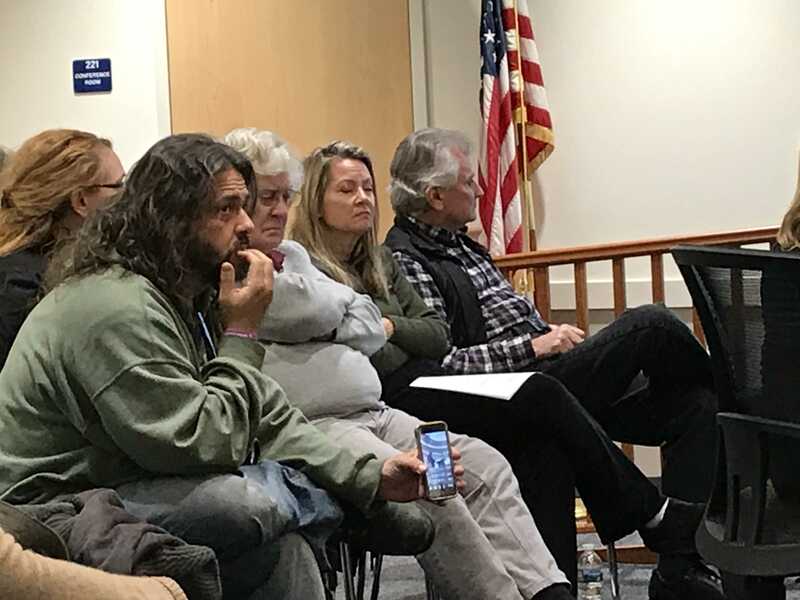 It’s not particularly common to smell the skunky aroma of marijuana at the entrance to a police station, but the first floor of Lavallette’s municipal building, which houses the department, got a hefty dose Monday night when a group of marijuana legalization advocates showed up to express their opinions at a borough council meeting. Edward “Lefty” Grimes, the group’s leader, was upset to see that Lavallette officials want to ban pot sales in town if the plant becomes legal in New Jersey – a campaign promise made by incoming Gov. Phil Murphy. Grimes, of East Hanover, is planning to protest a similar measure in Point Pleasant Beach at that town’s meeting on Tuesday night. The group broadcast their protest on Facebook Live to about 25 viewers, part of what Grimes calls the “Ignorance is no Excuse Tour.” Rose McGill, of Lawrenceville, said the council should be “armed with the facts, rather than panic and fear” when it comes to marijuana policy. Marijuana can be sold in a “mature, dignified and low-key manner,” the opposite of how bars promote the use of alcohol, said McGill, adding that access to cannabis is not something residents should fear. Grimes said the prescription dangerously-addictive narcotic painkiller fentanyl could be sold in Lavallette’s pharmacies, but marijuana sales would be banned if the council was to get its wish. Alcohol and tobacco are also sold in town, “but marijuana is not family friendly?” Grimes rhetorically asked, responding to the view that Lavallette, as a family-oriented resort, would not be a good location to open a dispensary. The borough has tasked its attorney with crafting an ordinance that would ban the sale of marijuana in Lavallette in the case it becomes legal. The attorney, Philip George, said the town will wait until the state acts to formally vote on a ban. “If you want to do it in your house, I don’t have a problem with that, but if you want to do it on our streets, selling it next to ice cream shops, etcetera, I’m against it,” Councilman David Finter said at a meeting earlier this month. Council members listened quietly to the group’s speakers, who all acted in a calm and respectful manner. Some officials, however, were put off by the fact that members of the group had apparently smoked marijuana outside the front door of the building. The unique smell of the plant overtook the building’s first floor as well as the elevator and was mentioned by numerous residents who attended the meeting. “The police were in contact before, and they told me there was nothing they could do,” said Mayor Walter LaCicero, of the incident. The group’s members who use cannabis have medical marijuana cards, meaning they broke no laws by smoking in public. Point Pleasant Beach has already formally introduced its ban on marijuana sales. Seaside Heights Mayor Anthony Vaz also called for a ban on sales in his town.